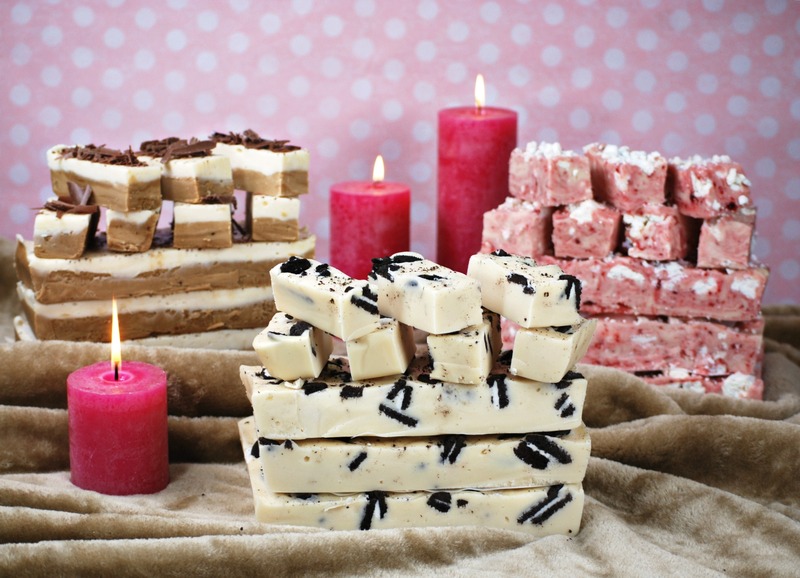 Happy New Year to all our Fabulous Fudge Friends! We hope you’ve all had a lovely Christmas and New Year, had some quality time with the family, a bit of relaxation and eaten plenty of delicious food – just hopefully not too much that you can’t still fit in a little bit of fudge! We thought we’d start the year off with a little update of what we’ve been up to over the Christmas break. Firstly, we’ve been busy designing a new Fudge Programme brochure for our kettle customers. Those of you who have purchased our microwave mix in the past may not know an awful lot about this side of the business but as well as our make at home mixes, we also manufacture and sell giant fudge making machines (called Fudge Kettles) which allow other businesses, tourist attractions, sweet shops, gift shops etc to make and sell their own fudge in quite literally hundreds of different flavours. It was time for a revamp though, so that’s what we’ve done. Have a look at some of the pictures below! For more info on our in-store fudge making programme, fudge kettle or how you could start your own fudge business click here. Secondly, we’ve been plotting madly for some tasty new treats to go in our online store over the course of this year. We want some nice new variety kits, a range of yummy retro sweets and potentially even some readymade gourmet style fudge which would make for perfect little gifts! More to come on these plans later on though…don’t want to spoil the surprise just yet! Do give us some feedback though and let us know if there's anything you'd like to see from us this year! Finally we’ve got a cracking recipe here for you to beat the January blues! It may also help you to use up some of the usual chocolates and biscuits leftover from Christmas. Here it is; Fully Loaded Fudge! Fully Loaded fudge is really exactly as it sounds. The idea is that you cram two layers of fudge full of all your favourite bits and pieces. (Obviously you’ll need some on top for decoration too). We’re going to tell you our version of Fully Loaded but you can put any twist on it you like to use up your Christmas leftovers! NB. This recipe makes two trays of fudge. Swirl 2 tablespoons of peanut butter into each tray of fudge, then crush up your Oreos™ and scatter these along with your mini marshmallows on top of each tray too. Make your chocolate fudge as per the instruction booklet and pour half the mixture over each of your two fully loaded trays. Put some of your leftover caramels or toffees in a microwaveable bowl and microwave them on a reduced power until nice and runny. Drizzle this over the top of your chocolate fudge then chuck on your Crunchie™ and some more mini marshmallows if you like! Remember, it doesn’t have to look pretty, the whole point is that it’s loaded up with tonnes of extra tastiness! To purchase your fudge mix and get going with some Fully Loaded Fudge click here. As always, please feel free to send in pictures of your creations, make any suggestions, ask us a question or simply just say hello and let us know how you’ve been getting on. We really do love to hear from you!